Papergreat: Take a ride with Edwards Motor Transit Co. This envelope (the front and back are pictured above) was tucked away inside an old book I came across awhile back. 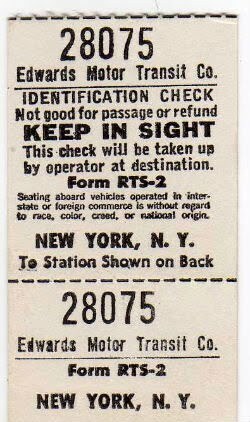 It came with a pair of ticket stubs indicating that some couple made a trip to New York City. Can't tell where they were coming from, though it could be any of the stops shown in the top image of the front of the ticket envelope. It's possible the travelers' origin was York, though it seems it would have been some circuitous to go from York north to Sunbury (or Williamsport) and then across to New York City. Edwards Lakes to Sea System was also known as Edwards Motor Transit Co. According to the Web site Keystone Connections, "Edwards Lakes to Sea served a large portion of the state of Pennsylvania and its routes reached into neighboring states of New York, Ohio and New Jersey directly and Maryland and Washington, DC via a pool arrangement with Greyhound Lines." Again according to Keystone Connections, Edwards Motor Transit Co. "was broken up in the early 1980s and its route system divided between Susquehanna Trailways and Fullington Trailways." Some additional history on Edwards Motor Transit Co. can be found in this in-depth history of mass transit in Williamsport and northcentral Pennsylvania. Finally, note the interesting fine print on the ticket stub: "Seating aboard vehicles operated in interstate or foreign commerce is without regard to race, color, creed, or national origin." That would seem to date this envelope and ticket stub after the passage of the Civil Rights Act of 1964. Hurrah for the return of the Relics work, and hurrah for your efforts here. I can't wait to see what you do in 2011! Thank you for finding and posting this piece of Edwards Motor Transit history. Such an important part of PA transportation for many years throughout the 1900's.